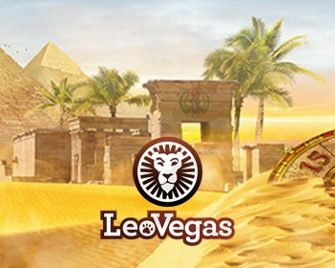 LeoVegas – €10K Treasure Hunt! Win up to €3,000 in cash and earn unlimited Free Spins! Travel back in time this week at LeoVegas and visit the ancient pyramids when you play Legacy of Egypt, the latest slot creation by Play’n GO. Join your fellow explorers for this superb giveaway to compete for a share of €10,000 in cash and earn unlimited Free Spins on Book of Dead. Start spinning! Yet another thrilling LeoVegas campaign and as usual it is multi-tiered. This time, players compete in a points race on Legacy of Egypt for a share of €10,000 in cash plus they can collect unlimited on Book of Dead when they hit the bonus round on the race game. Spin through the pyramids on the new Play’n GO slot with minimum €1.00 per round with cash or bonus bets to score points towards the leader board which will be updated every day at 15:00 CET. The final leader board will be published on the promotion page on 10th May 2018 with prizes being credited with no wagering requirements within 72 hours. The TOP23 explorers by midnight on 9th May 2018 will win a share of the cash prize pool: 1st – €3,000 | 2nd – €2,000 | 3rd – €1,000 | 4th to 13th – €200 | 14th to 23rd – €100. Additionally to collecting five points, players entering the Free Spins round on Legacy of Egypt will receive instantly a reward of 10 Free Spins on Book of Dead. The amount of Free Spins per player is unlimited. Wagering requirement is 35x FS winnings within seven days, subject to the LeoVegas bonus terms and conditions.